In their 18 years of marriage, a middle aged couple tries to move on with their lives after the husband confesses he's gay. Based on Fran Drescher and Peter Marc Jacobson's real experiences. I am looking forward to watching more of Living with Fran. Its not that bad. 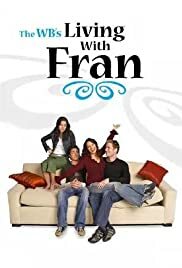 Fran seems to be a little out of place in this role, not being able to exhibit her New York, Jewish themes that made The Nanny such a hit. I was almost expecting Sylvia "Ma" Fine to be at the door or on the phone. And I missed Niles and CC. Charles Shaughnessy as a guest was great. He naturally fit in and for a minute it seemed like it was a continuation of The Nanny. Ben Feldman is very good and witty. Misti Traya is excellent as Allison and offers great commentary. Ryan McPartlin's acting is almost nonexistent and just as the show promotes, he is simply the good looking young guy. The relationship between him and Fran is very unrealistic, its almost forced. Fran and Charles on The Nanny had a very good on screen presence, as opposed to Riley, who is very wooden. Hopefully, he will learn from the comic genius that is Fran Drescher and become a great actor. I have faith in this show, it just needs time.